Interested in Contemporary European Studies? Apply for the Cologne Global Study Program! The Cologne Global Study Program (CGSP) is an academic certification program designed for students of the University of Cologne’s partner universities. It combines classes on Contemporary European Studies (taught in English) and German language courses. The program’s main goal is to provide an excellent academic environment for exchange students who do not speak German, but wish to study at the University of Cologne. This program strengthens the collaboration between the University of Cologne and its partner universities and fosters an international atmosphere on campus. Please find all descriptions to our current course program here. The Cologne Global Study Program is structured in two basic modules and one elective module. If you stay in Cologne for one semester, you can obtain the Certificate of Contemporary European Studies, consisting of 30 credit points (CP)*. All credit points will be documented in a Transcript of Records, as they may be transferred to your home university. You can start the 1-semester-program ahead of the semester (pre-semester arrival). This will provide you with more flexibility during the semester. If you are staying in Cologne for the entire academic year, you can obtain the Certificate of Advanced European Studies, worth another 30 CP. The structure of the second semester is identical with the first semester. Our counselling team will help you choose the classes that will complement best the knowledge that you have already gained. If you can stay only for a short time at the University of Cologne, you can still take part in the program and gain 21 credit points. We have designed the “early-leaver” track for you, which is offered once a year. Learn more details on the curriculum in our brochure. *) One credit point represents the workload of 25 to 30 hours per semester as defined by the European credit transfer system. The duration of the program is one or two semesters. Detailed program information and course descriptions for the summer term 2018 will be online early February. We highly recommend starting early by taking the pre-semester German language course. International English Language Testing Services (IELTS) (5,5) or equivalent tests. Proficiency in German is not required. Ask your International Office to be nominated as an exchange student for the University of Cologne. Nominated students will receive an information package from the University of Cologne and a link to our official application form. 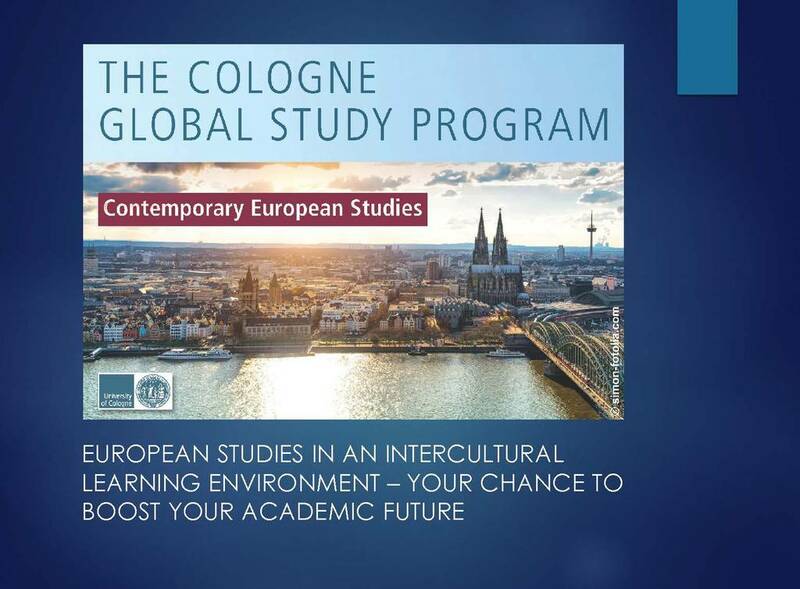 If you have decided to participate in the Cologne Global Study Program “Contemporary European Studies“ you must select the program on the online-application form. Please note: Your application does not guarantee participation in the program. The University of Cologne holds official partnerships with several universities throughout the world. If your university is not listed below, please check with your International Office if there is an exchange agreement with the University of Cologne. Please check with your International Office if they can nominate you as an exchange student for the University of Cologne. Language courses: The program consists of German classes for beginners if you have not studied German previously or advanced German classes if you already speak German. Content courses: You can choose between various core and elective courses in Contemporary European Studies. Can I participate partially in the program? The CGSP is a certificate program and full participation is necessary. You may be able to not participate and select single core courses through the Studium Integrale (speak with your faculty´s international office, called ZIB, for more details). Please note that there are only a few spots open for the Studium Integrale, the majority of the spots will be given to participants of the program. Do I have to take courses that are not part of the program? You should check with your home university before leaving whether it is required for you to take courses in your major/minor. Can I take courses that are not part of the program? You are welcome to take courses outside the CGSP-program, but you have to ask the CGSP-coordinators if they can be credited for the program. How do I know if my university is a partner university? If your university is not on the list above, please ask the International Office of your home university. How can I apply for a visa? Where will I live? Do I have health insurance? Please check our website Immigration and Residence for more information. There is no extra tuition fee for students from partner universities. Please check our website on living expenses on Cologne. Will I be able to transfer credits to my home university? Please check with your home university, what kind of courses/credits can be transferred before you leave. Upon completing your course work and exams here, you will receive a certificate and a transcript of records from us that will indicate your classes, grades, and credit points.